A 70-year-old female presented with short episodes of aphasia and disorientation resembling complex-focal seizures, with corresponding characteristic EEG features. MRI of the brain was unremarkable. Previous medical history consisted of coronary heart disease and absolute arrhythmia. Furthermore, she had weight loss of 6 kg of clinically undetectable etiology. The patient was treated with carbamazepin. After 4 months, a second admission was necessary because of progressive dementia. 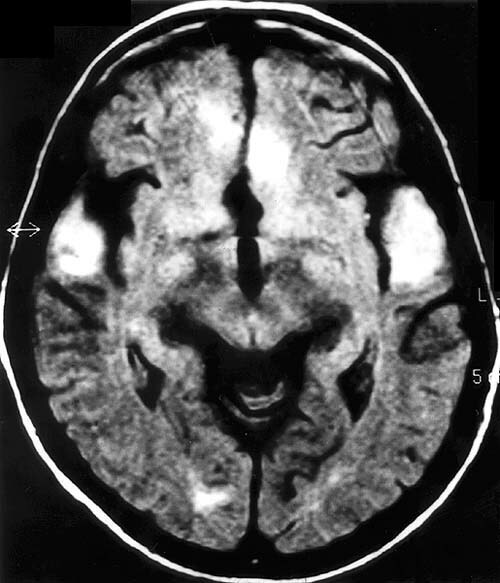 Repeat MRI revealed in T2-weighted images hyperintense lesions bilaterally in both temporal lobes, the right occipital white matter and in the region of the cingulate gyrus suggesting the clinical diagnosis of limbic encephalitis (Fig.1). Three weeks later the patient died from cardiac failure.